Unfinished crazy quilt without a backing or binding. 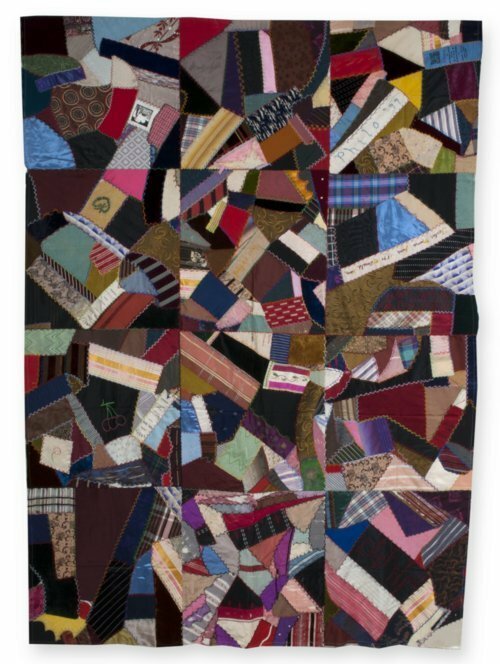 Quilt features many irregularly shaped pieces of fabric stitched to a cotton foundation and outlined in multi-colored embroidery. Embroidered names include the maker's cousin, Foster Means. The quilt incorporates printed ribbon badges with marks indicating the Northwestern Kansas Teachers Association and the Freemasons. The quilter was Henrietta Elizabeth Means Wilson. She made this top before her marriage to Oren V. Henderson on July 17, 1901 at Atwood, Kansas. Henrietta was an elementary school teacher and Oren served as Superintendent of Schools for Rawlins County.